Basilica of San Francesco | Just Visit Siena ! This church is certainly worth seeing! Both exterior and interior parts of the basilica for sure will attract your attention. 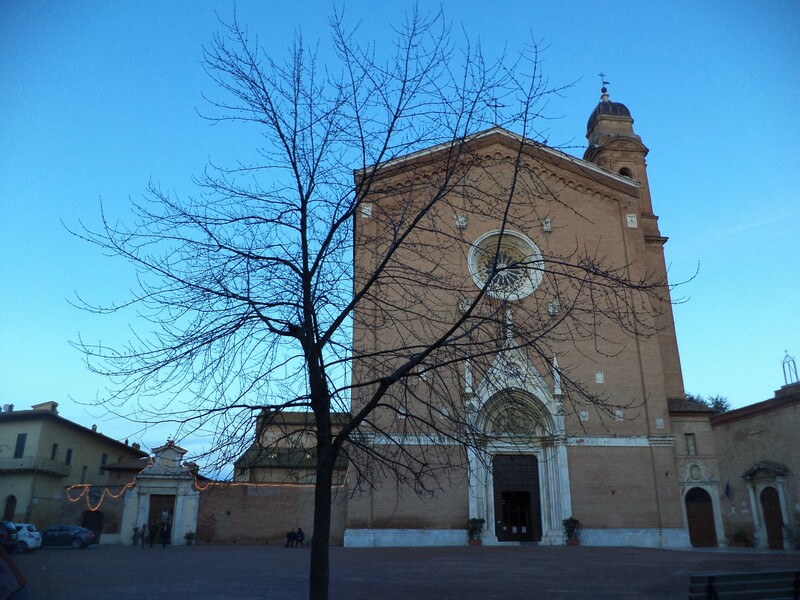 The Basilica di San Francesco that is located in Piazza San Francesco is one of the most important churches of Siena. Was built in the thirteenth century in Romanesque style, after (in the following two centuries) was enlarged and got Gothic structure. The church has a Gothic façade with bands of white and green marble. It can remind you the style of the outer side walls of the Cathedral of Siena. Easily you will see a portal of Francesco and a rosette, both of them by the Giorgio Martini. Among the decorations are: a pointed portal marble depicting, in the lunette, St. Francis and St. Bernardine in adoration of the Virgin and Child and on top of the spire, Christ with the cross. The coats of arms on the façade (that are made in marble) represent the city of Siena and families who have contributed to the maintenance and restoration of the church. The interior of the basilica that is on the Egyptian Cross plan, with a nave covered by spans and a transept will enchant you. The plan follows the pattern of Cistercian architecture. It means that is a simplified architectural model of the mendicant orders, which aimed at a time to create an environment on large, extremely suitable for preaching to a large crowd of faithful, and on the other to eliminate decorative excesses. The nave is in two bands with altars in the first and in the second Gothic windows. All walls are with bands of white and green marble (according to a Cathedral of Siena). However following the fire of 1655 and the restoration of the nineteenth century, the interior has changed a lot compared to the past. Certainly the biggest impression exerts windows that are made from glass F. Zettler of Monaco of Bavaria circa 1885-1890. They just make a specific atmosphere of the interior of the church. After the interior, when you are outside the church you can enjoy the incredible panorama of the historic center of Siena. I am convinced that after seeing the photos below will be impossible for you not see this place!